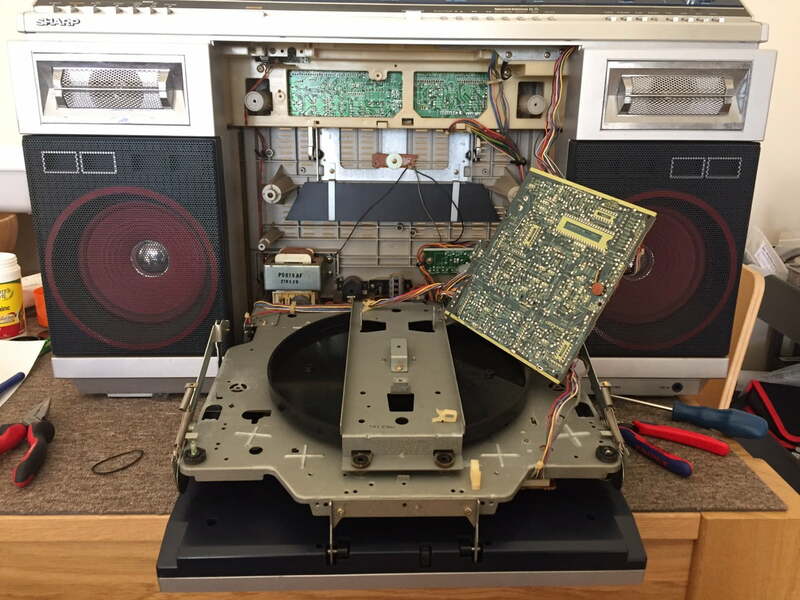 I’ve just finished overhauling this absolutely incredible Sharp VZ-2000 linear-tracking record-playing boombox! 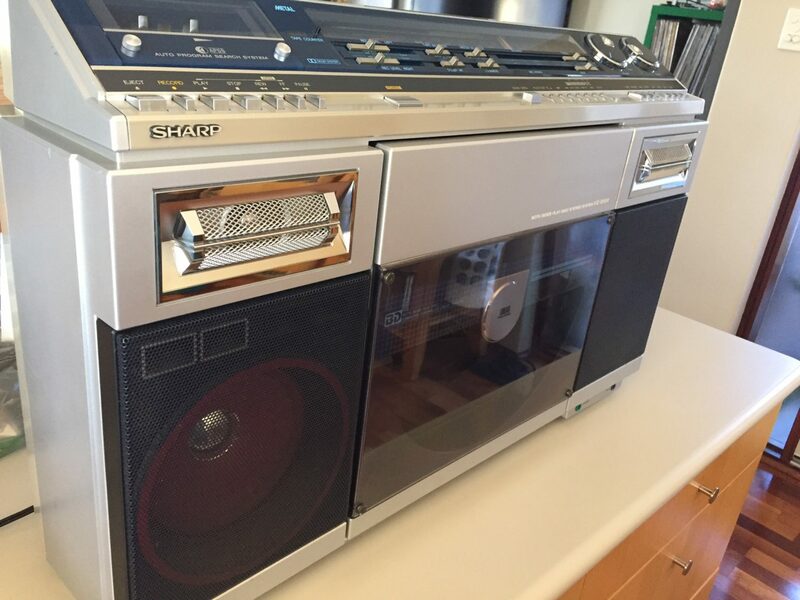 The Sharp VZ-2000 is one of the biggest and baddest boomboxes, from the golden era of boomboxes, the 80’s. This thing is seriously HUGE. I can hardly lift it and it took two hands to get it to this position for the photo-shoot. More info can be found at the the Classic Boombox VZ-2000 page and this great page at the Laughing Squid. For a demo of this great unit and to see it in action, check out my VZ-2000 video. For the record, this monster weighs 16kg, WITHOUT the ridiculous 10 x D-cell batteries you’d need to take your records to the beach. Seriously though, who would put this thing on their shoulder and take a bag of records to the beach anyway?! 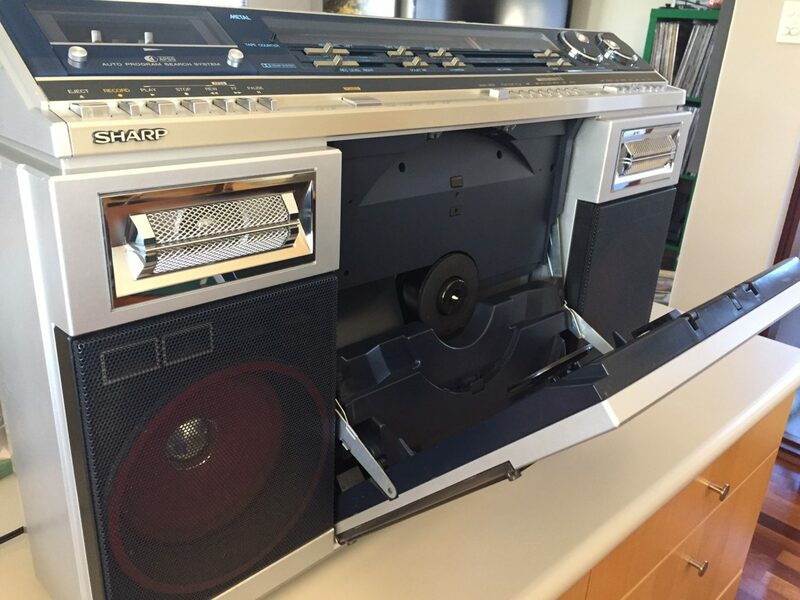 The Sharp VZ-2000 features a record player capable of playing both sides of your records without having to flip them. This in itself is a fantastic feature, essentially two linear tracking turntables in a box, with an amp and speakers. In addition, the VZ-2000 features a tape deck with Dolby B noise reduction and able to work with normal, chrome and metal tapes. All controls are soft-touch, operating a motor-driven mechanism. 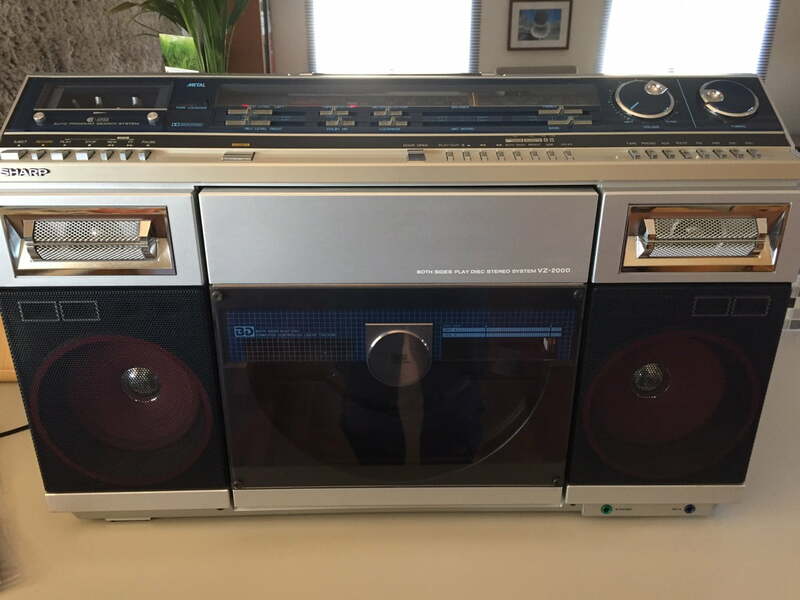 This a pretty decent cassette deck, in a boombox! This unit originally belonged to my customer’s grandfather, before being passed down to him, so it holds great sentimental value. The turntable didn’t work and the tape deck was filthy. The owner wanted it cleaned up and restored to fully working condition, giving it the care and attention it deserved. As you’ll see, that’s exactly what I did. This is how the VZ-2000 looked when it came to me. Hard to see here but its pretty foul, covered in dirt and dust. And so the disembowelling begins! I actually found this to be a really nice piece of gear to work on. Sharp designed this with serviceability in mind. Stories of people breaking boards when opening these up stem from careless work and not taking the time to understand how the unit goes together. 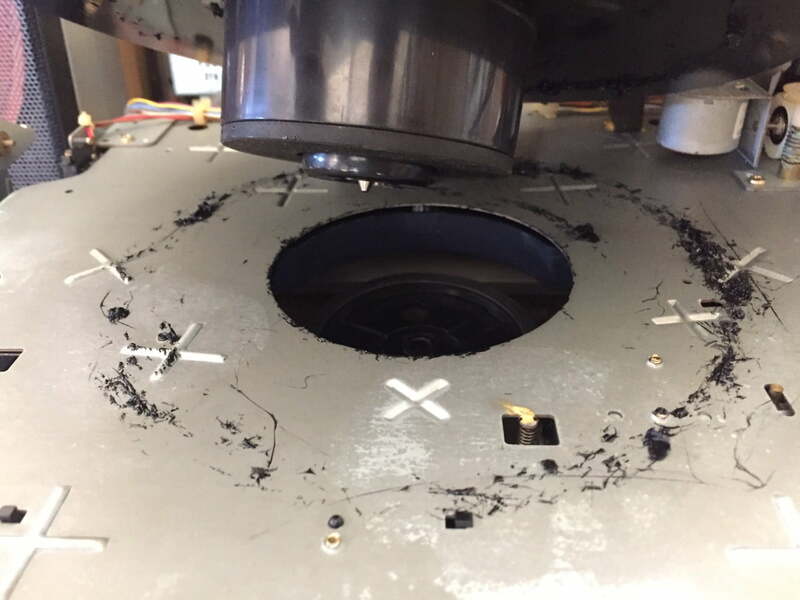 So the turntable’s rubber drive belt had perished into this horrible sticky residue that took ages to remove. 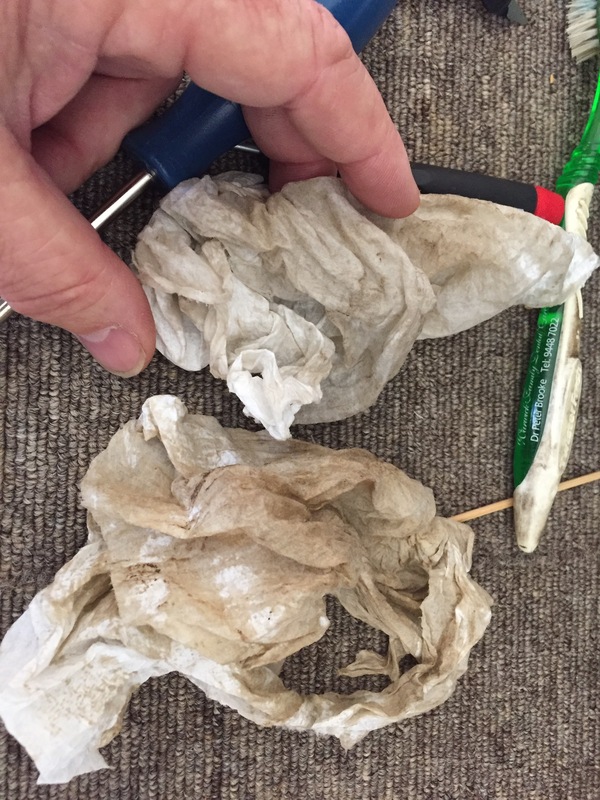 I used isopropyl alcohol to remove the residue and this worked very well. The linear tracking drive belt was also hard and perished and so I replaced that. I took the time to carefully grease and lube every moving part here, including the loading drawer, hinges, pulleys, pivots and bearings. Here she is, all cleaned up and ready for reassembly, just waiting for me to install the linear tracking belt. Then I started on cleaning the outside of this monolith. 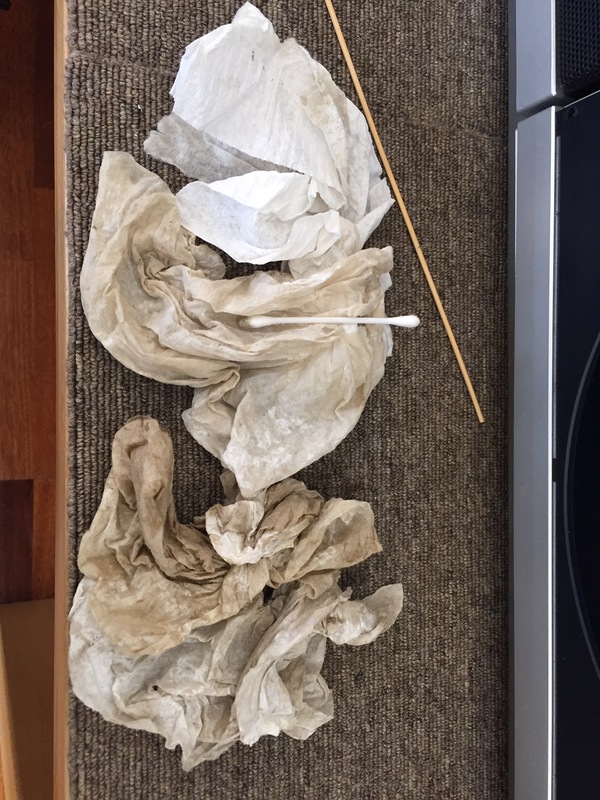 It took a good hour, lots of foaming cleanser and plenty of cotton buds and paper towel! 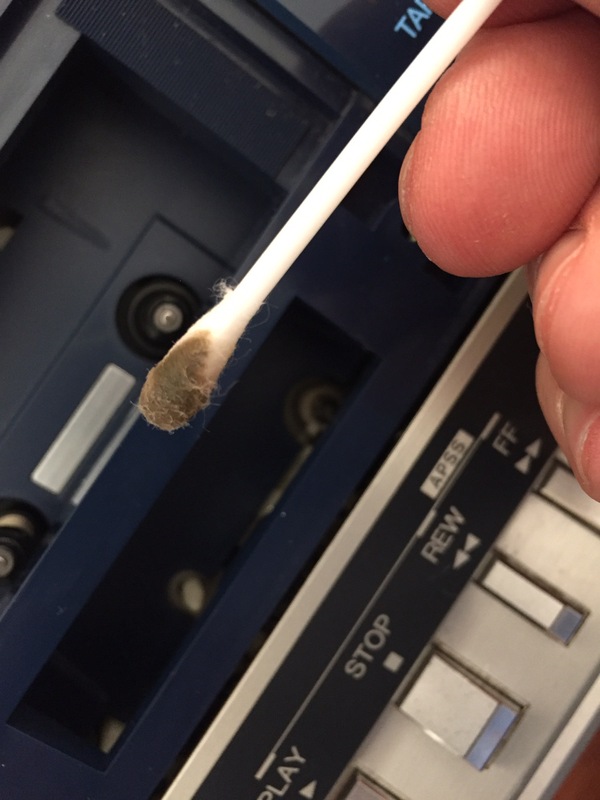 This is just a sample of the leftovers after cleaning the exterior of this VZ-2000. After cleaning and lubricating all the switches and controls, next step was to clean the cassette deck and tape path. 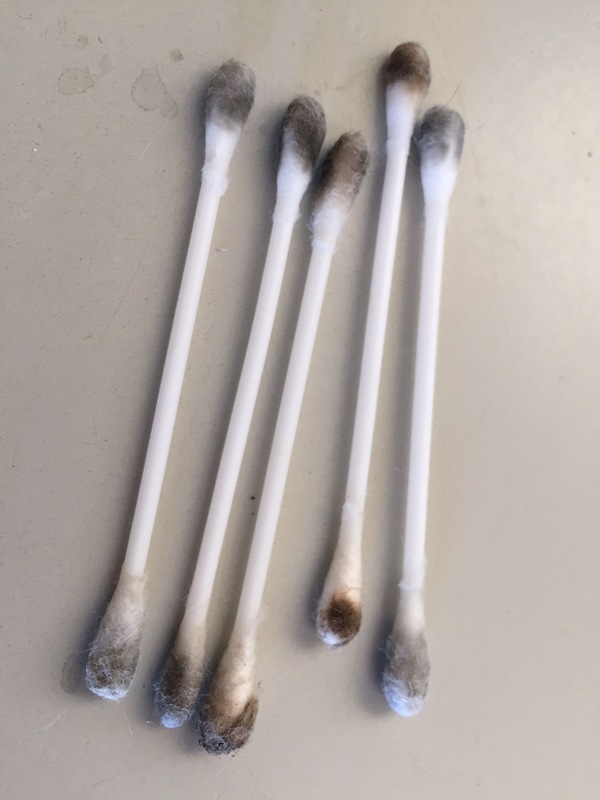 The capstan and pinch roller, along with the tape heads, were so dirty that I went through at least these five cotton buds, both ends soaked in isoprop! The end result though was well worth it. Look at how this beautiful VZ-2000 has turned out. I don’t think I’ve ever seen a happier customer when he collected this. He has a lot of love for the old VZ-2000, and it shows. 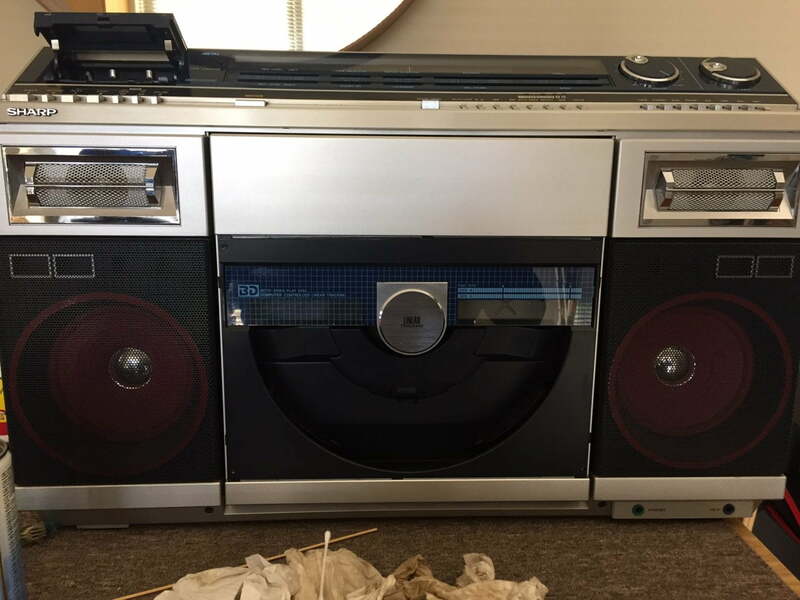 Thank you for taking on the restoration of my late grandfathers sharp Boombox, he purchased this the year i was born might i add!!. After thinking for sometime the record player was down and out, then changing a few hands on people giving me false hope in saying they could fix it, i had all but giving up. This is where Magic Mike came in, unlike the other previous experts mike promised me nothing apart from one thing i will have a look at it for you, i could see his confidence level for it wasnt high. While mike was busy doing turntables, amplifiers and his usual work “not 3 in 1 boomboxes”. A little time had passed. 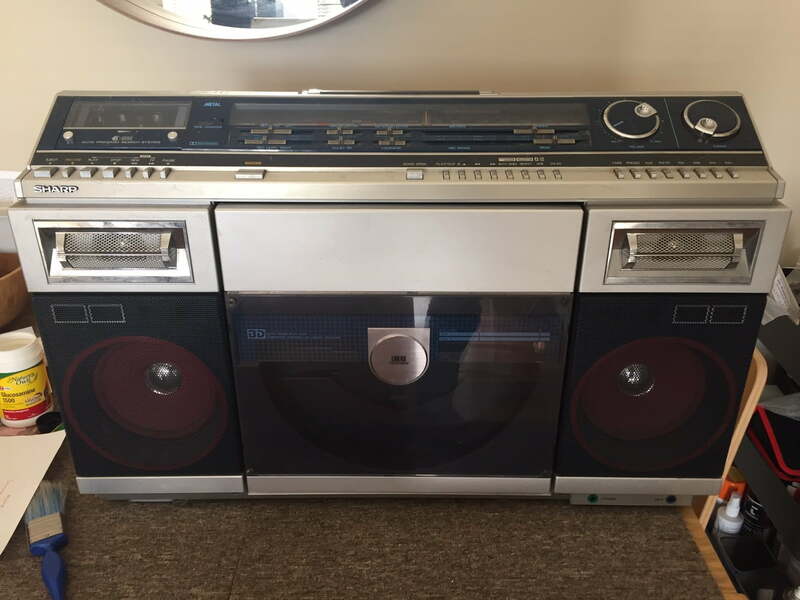 Then bang out of the blew mike calls and hes had a look at the boombox, cleaned it up and got it running. I thought an angel from above was tricking me. So i sets off over to liquid audio to check out mikes work. Yes, i couldnt believe my eyes it was clean and look like new, i can see my reflection in this thing and im not kiddin!! Astonished with this mans eye for detail. 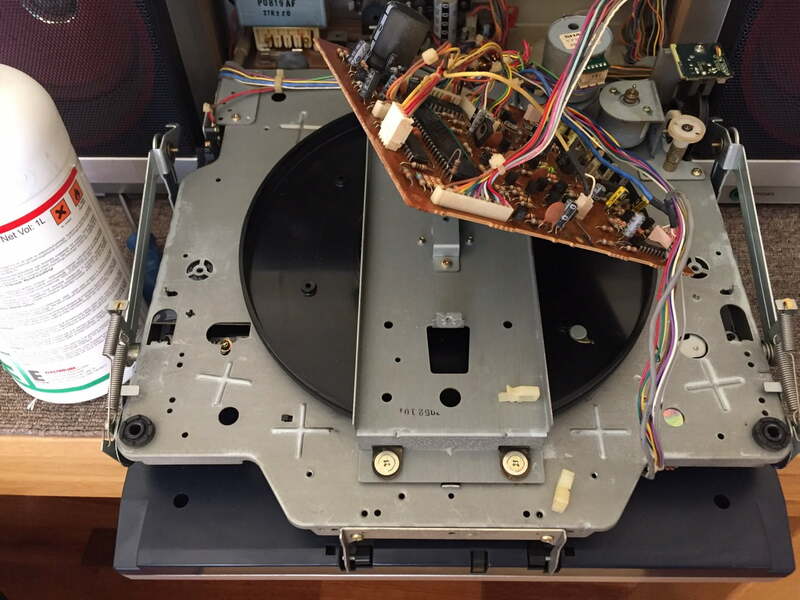 Stage 2 was the unveiling of the clean crisp mechanisms, opening and shutting the tape deck, the smooth movements of the radio tuner and last but not least the record door, which was jammed up you had to use force to fully undo it previously. These all opened just like new. With the power from above, ‘the cord Magic Mike had made for me’ he has plugged it in, firstly firing up the radio. 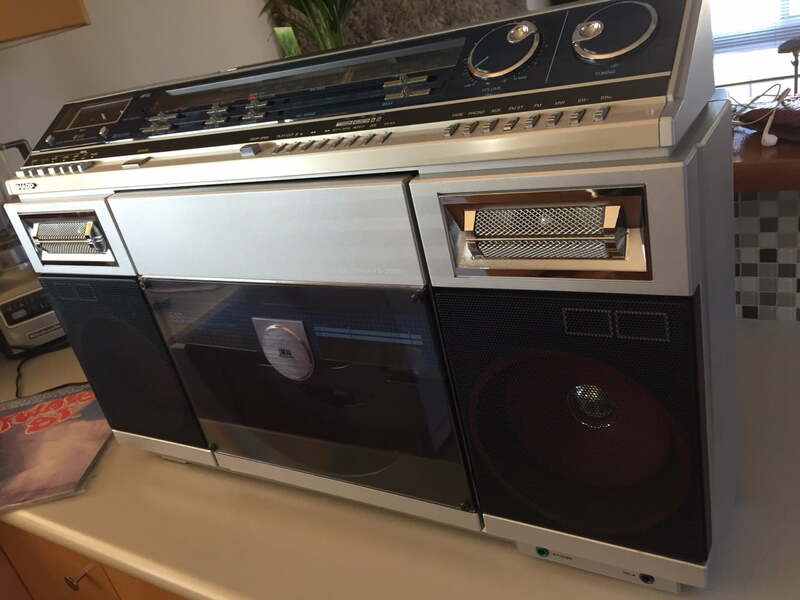 Then onto the tape player with this thing pumping out some ‘fully sik’ bass might i add, Last but not least we have played a record through it!! Simply amazing, for once in my life i’m speechless, i am overwhelmed with astonishment, i thought i would never hear it play again, would be 15 years ago since it last played a record. And it simply sounds amazing. After getting it home safely and showing it off to all my mates, i have been using it flat out. And follow up services and repairs if needed, will be no hassle knowing liquid audio is only a phone call away. Hi Marcus, a massive thanks for this incredible feedback and for giving me the opportunity to work on your VZ-2000 in the first place! Like you, I became quite enthralled with the unit and in restoring it for you. Honestly, it was worth it just to see the look on your face when you walked in and saw it again! I’m really glad she is working well for you and with the two new styluses we will fit today, she will be playing records better than she has in years. Thanks again for your feedback Marcus. Hi Barbara, thanks for getting in touch. I’m located in Carine, Western Australia. I wouldn’t like to speculate as to repair costs when I don’t know whats wrong with her, so I’d need to have a look before I could give you a better idea. If you’d like to book her in, please let me know. I’m very busy in the lead-up to Xmas though! Regards, Mike. Hi Barbara, the belt may well need to be replaced but they usually need much more work than this to get them working really well. I can’t recommend anyone in Brisbane I’m afraid. Regards, Mike. I found sliders to 3D print at Thingiverse. If needed let me know. 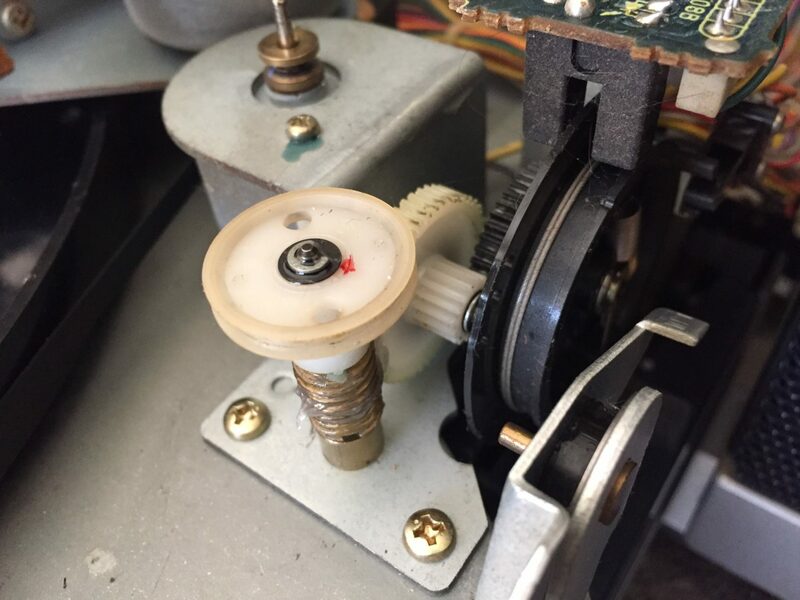 Hi Friends, I live in Sydney and have a VZ2000 in brilliant condition however last week i accidentally broke a slider knob while moving! Does anyone know where you can get a replacement? I’ve looked absolutely everywhere 🙁 any help would be appreciated.